Manchester City moved three points behind Arsenal with a convincing victory at the Ethiad Stadium. Arsene Wenger made five changes to the side that Napoli defeated at the San Paolo. Nacho Monreal, Theo Walcott, Aaron Ramsey, Jack Wilshere and Bacary Sagna were in the starting lineup. Manuel Pellegrini recalled Sergio Aguero, Alvaro Negredo, Yaya Toure and Samir Nasri to the starting line up. Arsenal’s complacent approach without the ball led to City’s dominant performance, as Pellegrini’s men were devastating in the final third. Coming off a midweek loss to Napoli in the Champions League, many questioned how Wenger and his men would respond. It’s uncertain as to whether their conservative approach without the ball was down to fatigue, but it allowed City to assert their dominance on the match. 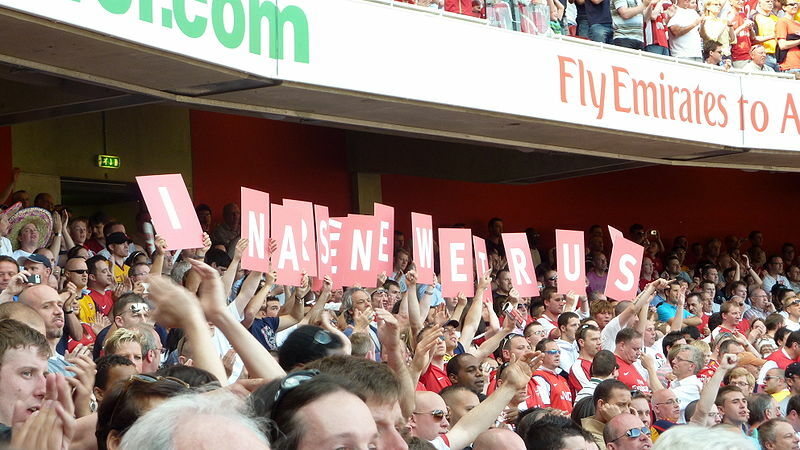 Wenger’s men dropped into two banks for four, but like their press was non-existent. 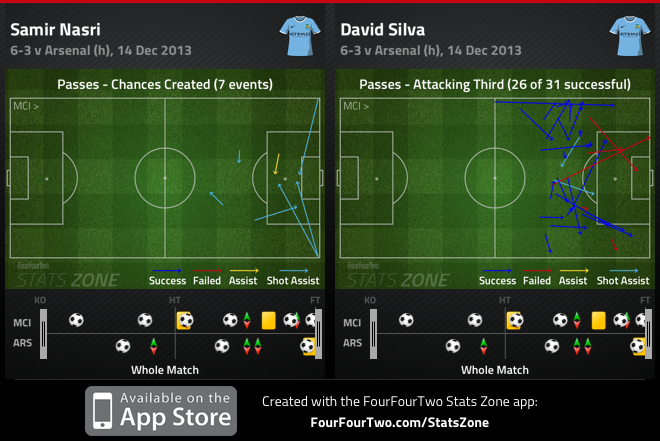 They allowed City’s midfielder’s time on the ball, while Silva and Nasri freely roamed between the lines. 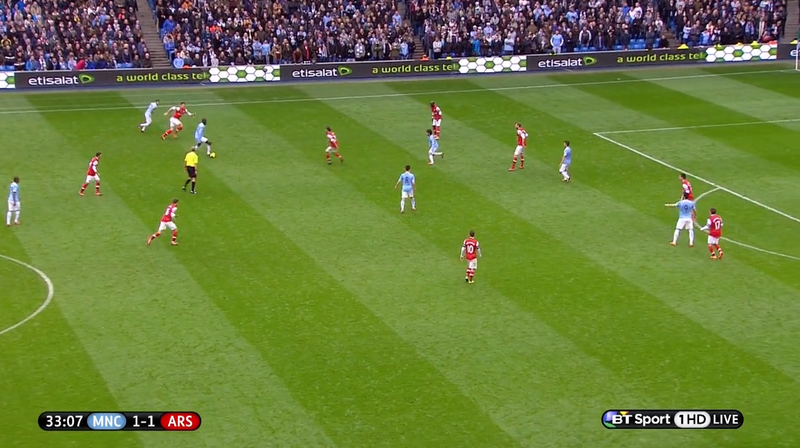 Arsenal invited pressure into their third, but they didn’t prevent City from asserting their dominance in these areas. On the other hand, while City also dropped into two banks of four, their approach was pragmatic. City minimized space between the lines for large portions of the match – Toure and Fernandinho sat closer to their back four, and the midfield pressed Arsenal’s creative players when they approached dangerous areas. Arsenal’s approach without the ball enabled City to get into better positions, whereas Pellegrini’s men displayed impressive work ethic to prevent Arsenal from penetrating in the final third. Nonetheless, the two teams had different approaches when they dropped into two banks of four, yet there shapes were identical. Both sides were fairly narrow when the opposition was in possession, and this encouraged fullbacks to push forward. Arsenal’s enjoyed a different element of attack this season through Sagna’s crossing ability from the right, while Pablo Zabaleta is renowned for driving into advanced areas. Gael Clichy was the least active fullback from an attacking sense, and this was logical, as he was the only fullback that was matched up against a legitimate wide player in Walcott. Zabaleta constantly pushed forward, attacking space behind Wilshere, as the Englishman was often caught in central positions. With Wilshere and Monreal dragged into the centre of the pitch, Zabaleta was a preferred outlet for Pellegrini’s men – coincidentally, it led to City’s second goal. Here, we see two issues with Arsenal’s approach – one, Toure is allowed too much time on the ball, and once again Zabaleta is free on the right flank. Arsenal’s midfield failed to close the Ivorian down, and he found Zabaleta on the right flank, which resulted in a well-weighed ball for Negredo to tap in. Sagna, also received space on the right to deliver crosses into the box, but unlike previous matches, the quality of the deliveries were poor – and when they did get into the box, Kompany did well to clear his lines. Arsenal struggled to create legitimate goal-scoring opportunities in the first half, but they did find an equalizer against the run of play. The goal was significant because it was one of the few times an Arsenal player pressed a City midfielder, and it highlighted Ozil’s use of half space. Ramsey stepped forward to dispossess Toure, and he drove forward to play a ball to Ozil on the left flank. Ozil ran into half-space after receiving the ball from Ramsey. He can now chose to go forward and continue to penetrate or look for an option. His run into half space forced Yaya Toure to track a forward run into the box, when he/or a midfielder should be looking to intercept a potential cutback. Ozil did well to attack the half space, and he played a cutback ball to Walcott, who placed his shot into the right corner. Ozil decided to make the cut back pass to the advancing Walcott, who is unmarked at the edge of the box. This is down to Ozil penetrating half space. Ramsey’s tackle was pivotal, but Ozil’s ability to efficiently utilize the half-space led to the goal, as it drew Toure and the rest of the City defenders into the box, thus leaving the edge of the area vacant. 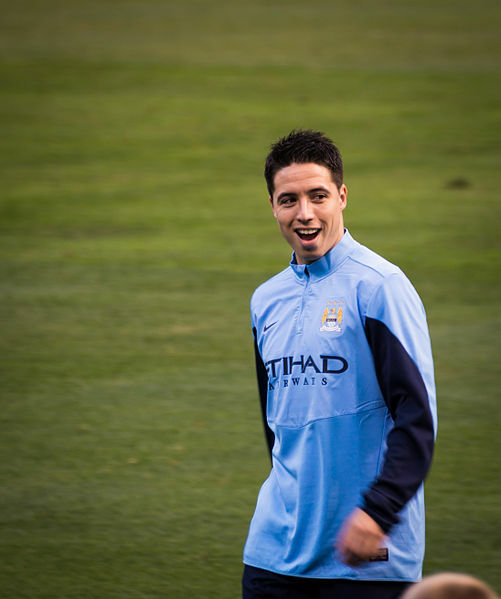 Another issue Arsenal encountered was their inability to contain Silva and Nasri. 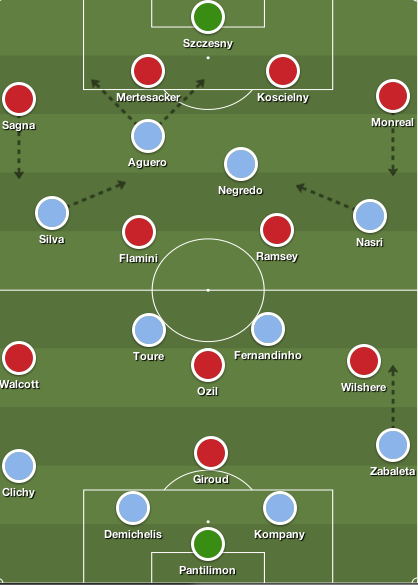 City’s fluid system is maximized when both players are in the XI, and they were a constant threat against Arsenal. The duo was City’s most proficient passers – alongside Toure – as they constantly buzzed around the final third. They dropped deep to help City push forward as a unit, but quickly found space between the lines to spring City attacks. Silva drifted around the final third, weaving in and around the edge of the area, yet he also ignited swift counter attacks. Whereas Nasri was more direct with his approach – he provided intricate passes, and nonchalantly drifted past his opposition at every opportunity. The Frenchman improved when moved into the no.10 role, but failed to score against his former side. 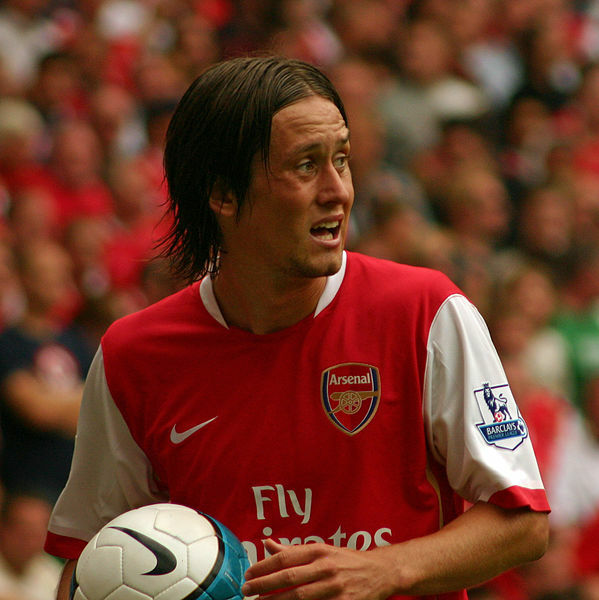 Shockingly, Arsenal struggled to close down the duo’s passing lanes or close them down – Nasri and Silva dominated Arsenal in the final third, leaving Wenger’s men to chase shadows. Arsenal’s best spell of the game lasted 13 minutes. Fernandinho increased City’s lead in the 50th minute, which led to Arsenal’s brief resurgence. In fairness, City should also be held responsible, as their lackadaisical approach saw them drop deeper towards their box and avoid their defensive duties. Ozil became a prominent figure as he dropped deeper into midfield to receive the ball and began facilitating passes, while aiming to create overloads in wide areas. 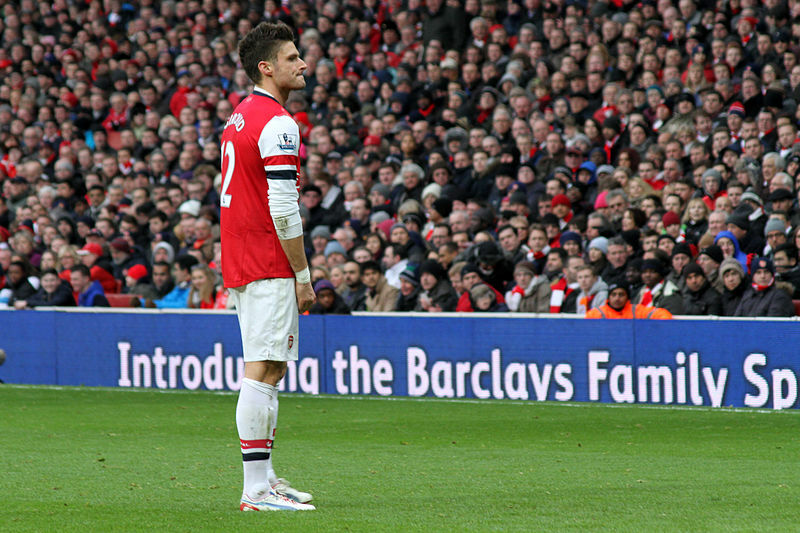 Olivier Giroud received wonderful chances to bring Arsenal back into the match, but his poor finishing let him down. Luckily for Arsenal, City continued to sit off, opposed to applying pressure, and as you can see below Ozil and Ramsey received ample space to create Walcott’s second goal. Ramsey is still unmarked between the lines. He’s free to receive the ball, and play a pass into Walcott, which leads to Arsenal second goal. There’s no pressure applied on Ozil and Ramsey, and they were able to find pockets of space to exploit. However, Arsenal’s lead was short lived, as City stormed forward on the attack once again, and negligence to Silva’s movement in the final third restored City’s two-goal lead. The way both managers utilized their substitutions was pivotal in the latter stages of the match, yet it also displayed an issue Arsenal possess. Pellegrini was forced to introduce Jesus Navas for Aguero, who suffered a calf injury. Subsequently, he also replaced Silva with Milner, thus pushing Nasri behind Negredo, as City became 4-2-3-1. This forced Arsenal’s fullbacks deeper due to City’s threat in wide areas, and it also injected more pace into the home side’s approach. Milner was fouled for City’s sixth goal, while Navas’ direct approach, led to his cross for Silva’s goal. More so, with the game now stretched, the injected pace constantly troubled the Gunners backline. The onus was on Arsenal’s their tired legs to search for a goal, and it let to mistakes that Fernandinho pounced on, which contributed heavily to his improved second half performance. As for Arsenal, they made a player swap by introducing Nicklas Bendtner for Giroud, while Serge Gnabry replaced Flamini. Wenger conceded defensive solidity in midfield for a direct wide threat, but neither Wilshere nor Ramsey were capable of completing their jobs. The match had slipped away from the Gunners, but Pellegrini’s substitutions preserved the result. City produced another superior performance at the Ethiad, and Arsenal’s feeble approach ensured that. They allowed City’s midfield to dictate the tempo of the match, Wilshere failed to track Zabaleta’s runs, and Wenger’s options on the bench failed to change the match. “It’s very important to be an entertaining team but I would prefer we won 6-0 rather than 6-3,” Pellegrini said. Pellegrini should be wary of City’s defensive frailties – while they do score a lot of goals, there were periods in the match where his men lost awareness, and were exposed by Arsenal. However, Wenger’s reluctance to tinker the squad is finally catching up with his side. This will be an interesting period for the league leaders, as the fixture list picks up, and failure to rotate the squad can lead to individual burnouts, and dropped points. Robin van Persie continued to haunt his former employers, as his first half header pushes Manchester United within five points of league leaders Arsenal. Van Persie returned to the starting eleven to lead the line ahead of Wayne Rooney, Antonio Valencia and Shinji Kagawa. Michael Carrick and Phil Jones formed a midfield duo, while Jonny Evans partnered Nemanja Vidic at centre back. Arsene Wenger made two changes to the side that defeated Borussia Dortmund in midweek. Mathieu Flamini returned to the lineup to join Mikel Arteta in the double pivot, whereas Thomas Vermaelen formed a centre back partnership with Laurent Koscielny. This was a vintage Moyes display – United’s reactive approach saw the Red Devils concede space on the flanks, as they sat in a narrow shape to nullify Arsenal’s threat in central areas. One of the main feats in Arsenal’s success over the past few weeks has been their fluidity and quick interchanges in midfield, so the battle in central areas was always going to be pivotal. David Moyes’ men were impressive without the ball – when they lost possession, they quickly closed down the Arsenal defenders to retain possession, and when Arsenal were building play they maintained an extremely high-line. Space was at a premium in midfield, and Arsenal’s attacking three were unable to receive the ball between the lines, as United sat extremely narrow to close down their passing lanes. Arteta and Flamini dropped deeper between the centre backs to provide an outlet for their defenders and build play – which was odd considering Rooney’s impressive defensive display against Arteta last season – but majority of their passes were sideways. Ozil and Ramsey also attempted to receive the ball in deeper positions, but Valencia and Kagawa pressed them once they received the ball. United’s wide men played an integral role in their success for large portions of the match. 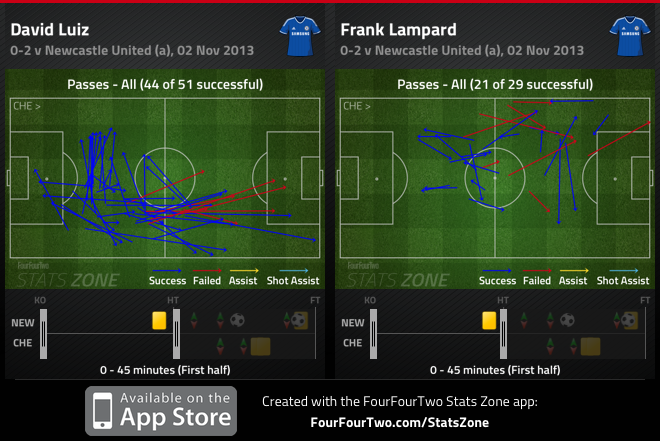 Kagawa and Valencia sat deeper than usual to help Jones and Carrick in midfield. Space was available out wide – which was risky based on Arsenal’s recent success in wide areas – but United’s wide men quickly closed down Bacary Sagna and Kieran Gibbs whenever they received the ball, and the Arsenal duo didn’t offer any threats going forward. 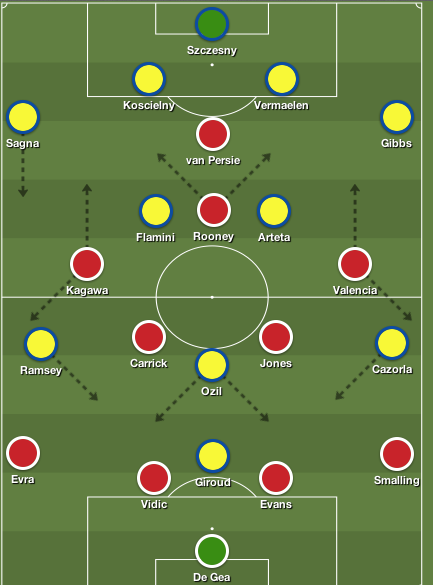 United’s initial approach without the ball was excellent – they minimized space between the lines, pressed Arsenal’s fullbacks, and kept their creative players quiet. During Arsenal’s impressive start to the season, Aaron Ramsey and Mesut Ozil’s form has overshadowed the underlying importance of Olivier Giroud in Wenger’s set-up. The French striker has improved vastly over the past few months, and has been a significant cog in Arsenal’s attack, which is why Moyes was keen on limiting his impact on the match. Giroud’s developed a better understanding of playing as a lone striker using his brute strength and impressive work rate to thrive as Arsenal’s main man. The French striker struggled in the first half due to great defensive work from Evans and Vidic. The United centre back duo stuck tight to Giroud whenever he received the ball, and the Arsenal striker was unable to sustain possession. One of the main feats in Giroud’s game this season has been his ability to link play with Arsenal’s midfielders, and allow runners to attack space behind him. But Giroud was outmuscled off the ball – often conceding possession or losing out in duels against the United centre backs. There was no space in midfield for Giroud to tuck into – United’s midfield pushed higher up the pitch swiftly to catch the Frenchman offside on numerous occasions, and his frustration was evident. Vidic was forced to leave the match at the interval, due to his late collision with David De Gea in the final moments of the first half. This forced Phil Jones to drop into centre back as Tom Cleverley joined Carrick in midfield. Although Cleverley didn’t produce a poor display, United’s lack of a double screen meant Arsenal would receive more opportunities to stamp their authority on the match. Giroud’s influence on the match grew in the second half, and this was odd because Evans still featured in the match. As gaps began to build between the lines, Giroud was presented with more space to receive the ball and spread play, as Evans and Jones sat off the French striker. There was also a distinct dip in Kagawa’s performance – this could’ve been fatigue based, as he was involved in Wednesday’s midweek draw against Real Sociedad. Ramsey started the second half on the right touchline stretching the play, and he played a key pass to Giroud in the 47th minute in ample space, and Cleverley was forced to foul him as he ran past the United defence. Three minutes later Ramsey won a loose ball at the halfway line, and played the ball into Ozil who combined with Giroud, but was unable to produce the final ball. Ozil had brief glimpses of positivity in his play as he drifted laterally into pockets of space on the right flank behind the United defence to receive the ball, and Santi Cazorla also dropped into those pockets of space to push Arsenal forward. 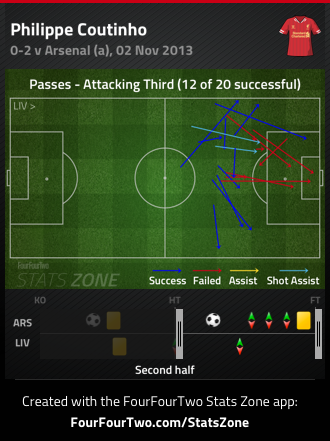 In the latter stages of the match, Arsenal continued to penetrate pockets of space in wide areas. Ramsey picked out substitute Serge Gnabry, who made a run behind Evra and Ryan Giggs. The Arsenal youngster played a ball across the edge of the box to Giroud, who skipped past Jones, but Smalling made a timely tackle to clear United’s lines. A minute later, Sagna played a pass to Jack Wilshere, who moved forward and found Ramsey in a pocket of space behind Evra. Ramsey surged into the United box but was crowded out by Cleverley, Evans and Evra, and the ball fell to Giroud who flashed his deflected shot wide of the net. Although it may have been Moyes’ idea to hit Arsenal on the break, Vidic’s departure and Kagawa’s inability to protect Patrice Evra gave Wenger’s men a lifeline in the second half. Giroud and Ozil improved slightly, and as a unit Arsenal were getting into better positions. As stated earlier, Arsenal experienced joy down the right flank during the second half, and their star performer was Sagna. The Arsenal right back has been a key contributor in Arsenal’s attack over the past few weeks, as he played a pivotal role in goals in home fixtures against Napoli and Borussia Dortmund. Sagna was Arsenal’s bright spark in the second half as he constantly found space behind Kagawa, leaving him free to get forward and play crosses into the box. Majority of Arsenal’s best moves came down the right flank, and Sagna’s crosses gave Moyes’ men a few scares. 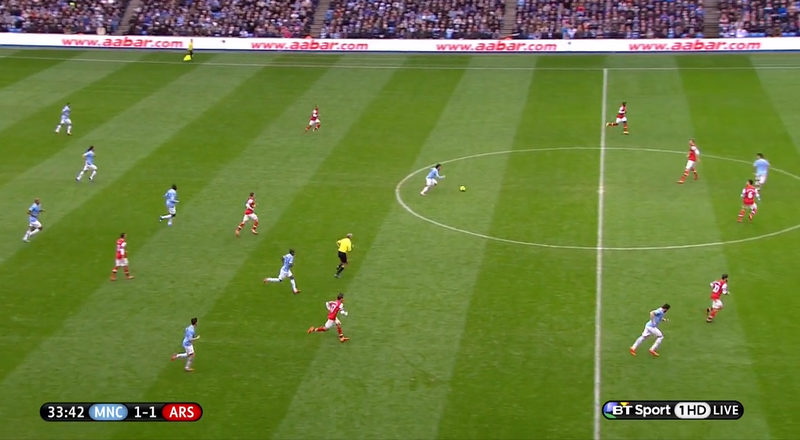 57th minute: Ozil’s corner kick was half-heartedly cleared, and Vermaelen played the ball backwards to Sagna. Sagna sprayed a ball across the box to an unmarked Ozil, but the German maestro fired his shot into the side netting. 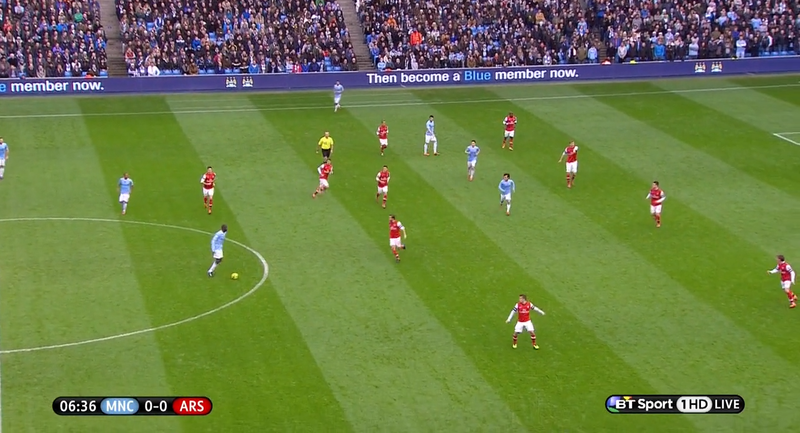 72nd minute: Kagawa was caught out in a central position and Arteta picked out an unmarked Sagna on the right flank. Sagna played a precise ball across the six-yard box, but Evan’s nicked it past Gibbs, Smalling and Giroud for a corner. 91st minute: Sagna throws the ball into Giroud, and the Frenchman laid it off to Gnabry. Gnabry plays a pass to Sagna – who’s behind Giggs – and he delivers a venomous ball into the box that evades Evans, Jones and Nicklas Bendtner. Sagna created three clear-cut opportunities for Arsenal to equalize, but his teammates were unable to connect with his fantastic deliveries into the box. Wenger was forced to turn to his bench early in the second half, and he decided to introduce Wilshere for Flamini. Prior to the substitution, Arsenal lacked penetration in the final third, and struggled to get behind United’s defence. The move was made to add guile, energy, and penetration into Arsenal’s attack and from an attacking perspective the Gunner’s were brighter. Bendtner and Gnabry also made appearances in the latter stages of the match, as Arsenal became a 4-4-2. Gnabry had a positive impact on the match with his direct approach and his ability to combine with Sagna, and Arsenal’s attacking players. Bendtner’s introduction was peculiar, as he took up a position on the left flank. The Danish striker isn’t renowned for his ability to beat players, but Wenger was hoping that he could get on the end of Sagna’s crosses. 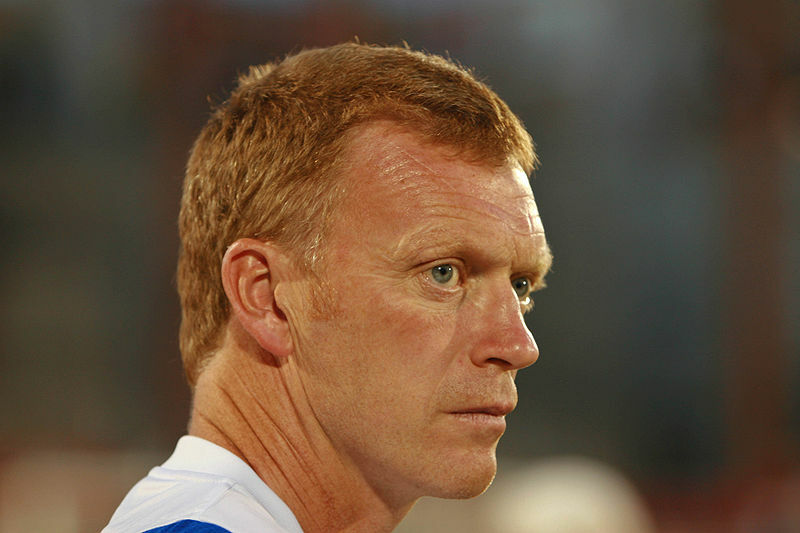 Moyes’ substitutions reflected United’s approach in the final minutes of the match. Giggs replaced Kagawa in hopes that he could provide better protection for Evra. While Marouane Fellaini replaced van Persie, as United became a 4-5-1 without the ball to preserve their lead. Arsenal improved in the second half as United sat deeper, but Moyes’ reactive approach was successful, as van Persie’s first half winner claimed maximum points. The gap between United an Arsenal is now five points, but it’s difficult to assess the progress of Moyes’ side. Nonetheless, It was a vintage big match display masterminded by Moyes – United were organized as a unit, and once they went ahead they cautiously attacked on the break. Similar to their away draw against West Brom and loss against Chelsea, its been proven that an organized narrow shape can frustrate the Gunners – thus emphasizing the importance of their injured direct attackers. Arsenal weren’t at their best today, but dropping points at Old Trafford doesn’t necessarily inhibit their title aspirations. How the Gunners respond to this defeat heading into the Christmas period will be vital. Olivier Giroud was the difference maker in Arsenal’s slender North London derby victory. Arsene Wenger made three changes to the side that cruised past Fenerbahce in their midweek Champions League qualifier. Giroud, Santi Cazorla and Theo Walcott formed an attacking three, while Tomas Rosicky replaced the injured Lukas Podolski, and formed a midfield trio with Aaron Ramsey and Jack Wilshere. Kieran Gibbs started at left back, and Laurent Koscielny returned from suspension to form a centreback partnership with Per Mertesacker. Andre Villas-Boas made several changes to the side that dispatched of Dinamo Tbilisi in midweek Europa League action. Roberto Soldado, Andros Townsend and Nacer Chadli led the attack in Villas-Boas 4-3-3, while Moussa Dembele, Paulinho and Etienne Capoue formed a midfield three. Erik Lamela started the match on the bench, while new signing Christian Eriksen was unavailable. Arsene Wenger learned from previous mistakes in the last North London derby, which proved to be decisive, in a match that contained a few tactical features. An interesting feat in this match was always going to involve how both sides were aligned without the ball. In last season’s derby at White Hart Lane, both sides played extremely high-lines. Arsenal suffered due to the pace of Bale and Lennon, along with the space available between the lines for Gylfi Sigurdsson and Scott Parker to exploit. Spurs were able to get behind the Arsenal centre back pairing of Mertesacker and Thomas Vermaelen, which proved to be the difference. Wenger learned from last season’s outing that nearly jeopardized Arsenal’s Champions League spot, and ordered his side to sit a bit deeper. 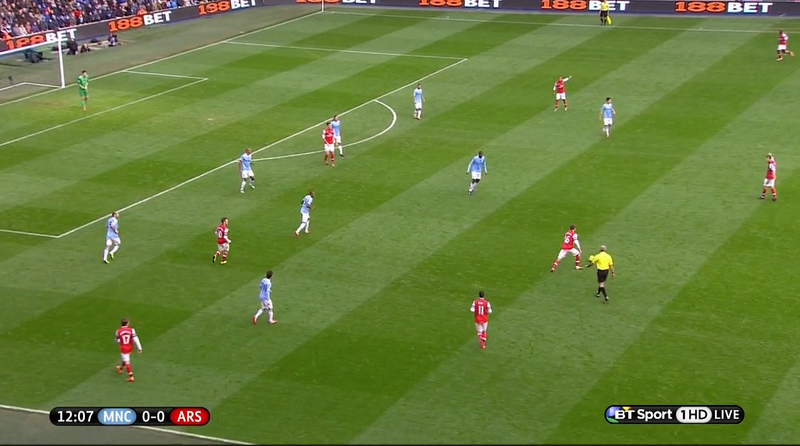 Wenger’s men dropped into a 4-5-1 that sat off and minimized the space between the lines. In particular, Ramsey was one of their better players on the defensive end, as he thrived in Arsenal’s midfield five. It’s key to point out that the constant pressure that Giroud and Rosicky applied on Jan Vertonghen and Michael Dawson. Both men were able to push forward and play positive forward passes last year, and Wenger instructed his the duo to close them down, when possible – limiting their influence on Spurs’ attack going forward. However, Spurs played a high-line, but were unable to replicate last season’s success. Arsenal looked most threatening on the break, where they could expose Spurs’ high-line. Their main outlet was Walcott – his pace troubled Danny Rose at times, and it was from this element of attack that handed Arsenal the lead. Ramsey broke forward and played a pass wide to the unmarked Walcott, and the Arsenal winger’s ball met Giroud’s run at the near post and the Frenchman tucked the ball under Hugo Lloris. Arsenal was conservative without the ball, whereas they took a page out of Villas-Boas’ strategy last season, to harm their North London rivals. The midfield battle proved to be the decisive factor in the result. Spurs fancied their chances due to their physical superiority, but Wenger replicated his decision in the second half of last season’s tilt at White Hart Lane – where Arsenal significantly improved – Cazorla was the main man, drifting centrally to overload the midfield. Cazorla helped Arsenal push forward in attack – he provided a spare passing outlet in midfield, and also disrupted Spurs’ approach in midfield. Now Tottenham had to worry about the tricky Spaniard drifting infield, and Villas-Boas’ midfield three were constantly dragged out of position. Cazorla was allowed freedom to play key passes in the final third, and was often the distributor in majority of Arsenal’s legitimate goal-scoring opportunities. Wenger acknowledged the threat Spurs posed in midfield, so the inclusion of Cazorla was logical, based on its success last season and the numerical advantage his side gained. For all of Arsenal’s success in the middle of the park, Spurs did enjoy some freedom in wide areas. 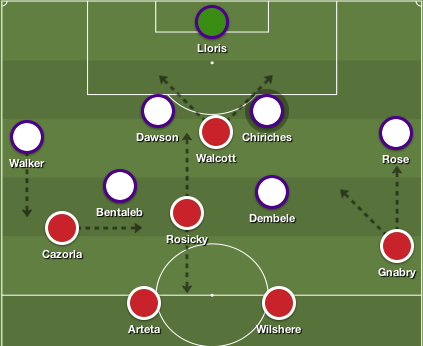 Villas-Boas instructed Chadli to take on the inexperienced Carl Jenkinson, and in the opening moments of the match Jenkinson was being exposed as Rose got forward to create overloads. Unfortunately for Spurs, Chadli didn’t maintain his impact on the left flank, and can be criticized for not assisting Rose cope with Walcott’s threat on the counter. 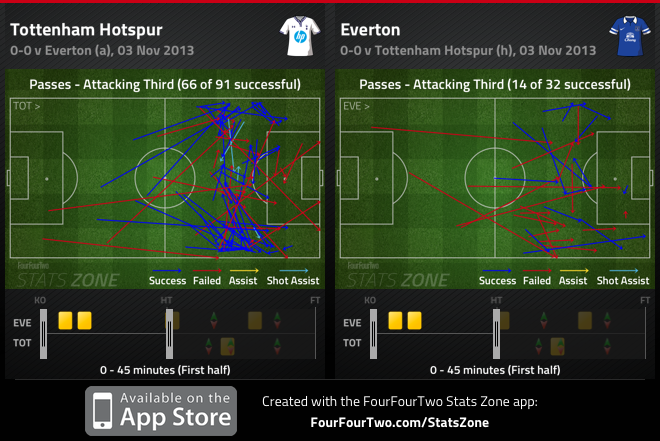 On the other flank, Townsend looked to be the most influential Spurs player in the opening minutes of the match. With Cazorla tucked in, Walker surged forward, which allowed Townsend space to cut in and take shots from distance, forcing Wojciech Szczesny to make a few saves. It was a recurring theme in the opening 30 minutes, but as the match wore on Cazorla began to track back to provide Gibbs cover. 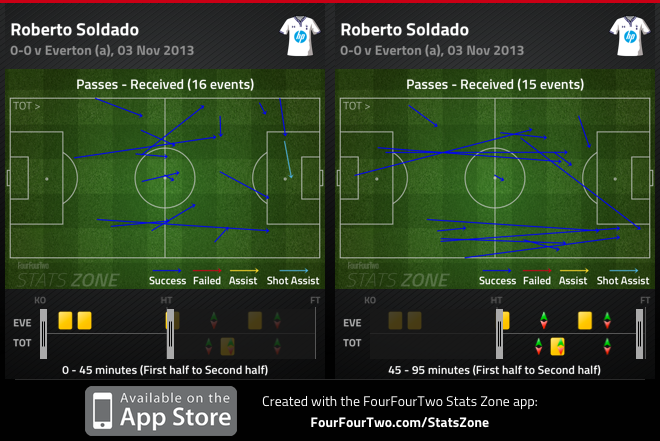 Roberto Soldado has been somewhat of a saviour for Spurs since his arrival from Valencia. In fact he’s scored the winning goal in both of Tottenham’s Premier League victories, leading up to this derby, which is why is performance was pivotal to Spurs’ success. Unfortunately for Villas-Boas, Soldado was marked excellently by Koscielny and Spurs’ midfield lacked guile going forward to provide the Spaniard the service he required. 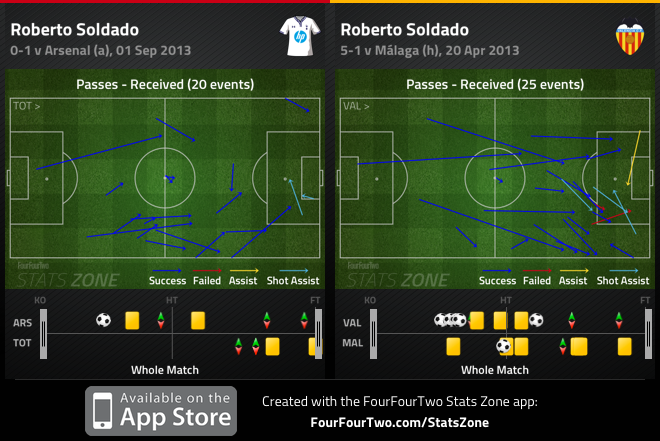 Soldado scored two goals against Malaga last season, but there’s a clear difference in where he receives the ball in both matches. 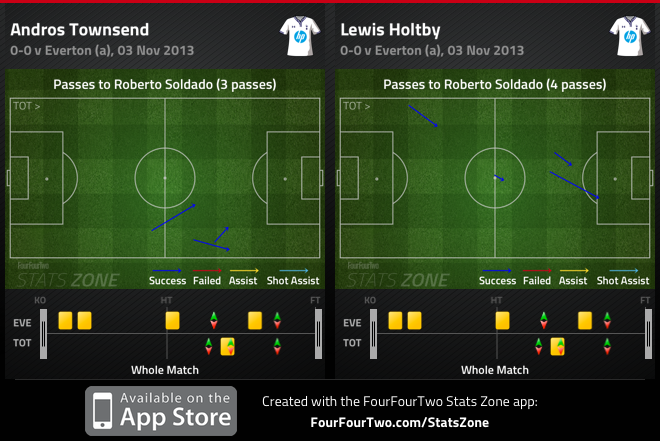 While Soldado was often an isolated figure, it leaves one to question Villas-Boas’ decision to leave a player like Lewis Holtby or Sigurdsson on the bench. It’s evident that Eriksen will play an integral role as Spurs no.10, but Spurs have lacked a link in between midfield and attack this season – and Soldado needs ample service to perform at the highest level. Arsene Wenger learned from his mistakes in last year’s North London Derby at White Hart Lane, and modified them this year, which gave his side the edge over Spurs. Overloading the midfield, pressing the Tottenham centre backs and sitting deeper as a unit, were key factors in their victory at the Emirates. Spurs will be disappointed with the loss, and it will take time for Villas-Boas’ men to hit full gear. With several new arrivals, the Tottenham manager and supporters will have to wait for this newly assembled side to find form. They’ve added the pieces over the summer to challenge for a Champions League spot, and despite the loss, are still favourites to achieve that feat. As for the Gunners, they were able to slip past their North London rivals, continuing their great run of form. Despite purchasing a world-class talent in Mesut Ozil on deadline day, they still possess a thin squad. Injuries, loss of form and suspensions will all play a factor over the course of the season, and if they intend on challenging on four fronts, the squad available isn’t enough. However, they displayed that they still have a lineup capable of showing up for a big occasion – a North London derby – and they did get the better of Villas-Boas’ men.